Duquesne University School of Law hosts a roundtable on Intellectual Property and the University on April 19 & 20, 2015. The roundtable brings together leading scholars of intellectual property from schools of law, business, and public policy to analyze the policy and legal implications of intellectual property ownership and disputes involving higher education. 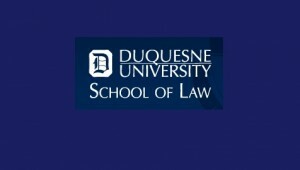 Papers presented at the roundtable will be published in a special symposium issue of Duquesne Law Review in Winter 2015. Papers anticipated for publication explore the following: evolving university technology transfer structures and innovation paradigms; university patenting of nanotechnologies; university ownership of copyrights; copyright fair use issues in higher education; plagiarism in higher education; student intellectual property and law school clinics; and auctions of university-owned patents. For more information, please contact Professor Jacob H. Rooksby, the roundtable’s organizer, at rooksbyj@duq.edu.